Eric Lloyd Wright and his wife Mary, an artist, paid a visit to the Martin House early this week, their second in the past few years. Eric was highly enthusiastic about the restoration and indefatigable during a tour that lasted three hours. He brings an interesting perspective to the whole house tour enterprise. Typically, tour groups walk through the buildings while listening to a docent talk about the architect, the client, and the architecture, but there is little or no opportunity to experience the building from a seated position owing to the historic and monetary value of the furnishings. Eric reminded us that his grandfather said "you must sit down in my buildings to appreciate them." Eric's solution -- bound to be controversial -- is to remove the original furniture, turn it over to a museum, and have each piece reproduced so that people can begin to experience the house as it was intended. He points out that his grandfather designed the furniture but he didn't make it. The drawings (for the Martin House) were sent off to firms like the Matthews Brothers in Milwaukee for production. Over dinner Eric reminisced about visiting and working on Taliesin West when he was ten years old. 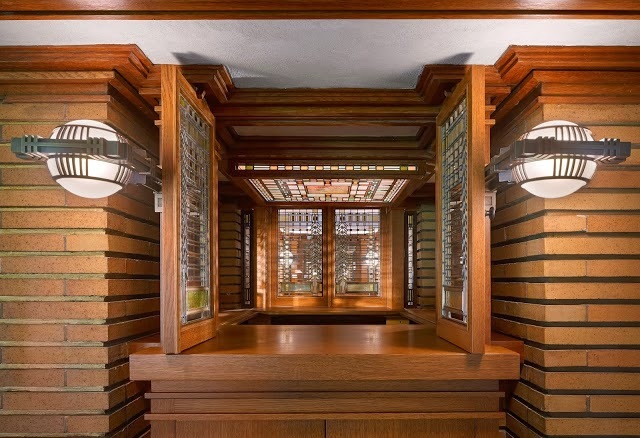 Although he attended UCLA he was very much a product of the Taliesin Fellowship and the tutelage of both his grandfather and his father, Lloyd Wright, one of the most original and successful interpreters of Frank Lloyd Wright's organic approach to design. Through his own firm, which is often involved in the restoration of the works of both his father and grandfather, Eric has been increasingly involved in the green architecture movement as an outgrowth of Frank Lloyd Wright's organicism. I agree completely with Eric's approach to the furniture! I also agree with Eric's approach. With one exception, FLW designed houses and furniture to be used. Why not consider just using the furniture and then restoring it when the finish is too scratched or upholstery worn out. Most of his designs were very durable. If the Martin family still owned the house, they would be using the furniture and maintaining it accordingly like other wealthy families do now. I know it has a high value, you want to keep the house to a certain date, and I respect not using it on that basis. On the other hand, perhaps as time goes on and the generation more familiar with Wright is gone then the following will be more interested in seeing his work if they can sit in the original furniture and enjoy the restored original space. When I went to Taliesin in Wisconsin we were invited to sit down in the great room on the furniture. I don't know if it was originals or copies. And it did give me the chance to really look at the space and enjoy it more then just standing around. You could also sell it to a local museum to set up in mock rooms for the other effect. Fake room original furniture. No doubt the insurance on the complex would go down too if it had reproductions.